This most interesting release on Helios has caused some excitement here in Ireland because it features three works by John Mahon. 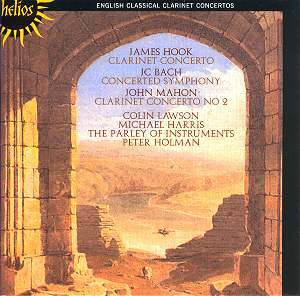 They stand well against a work by J.C. Bach and a solid concerto by Hook. John Mahon�s details are a bit thin although Peter Holman�s sleeve-notes are superb, However I decided to consult Prof. Harry White of UCD and Dr Barra Boydell of NUI, Maynooth because they are co-writing an important reference book about Irish composers, A few solutions came up ab initio. Holman comments on Mahon�s lack of lower register being a matter of available instruments is duly supported. Both John Mahon and his brother William were mainly executant musicians working for a living. John was born in Oxford about 1749 into a quite large Irish family. He became one of the most important clarinettists of the late 18th century in England and Ireland; I quote Dr Boydell. From this we may infer that the Mahon �boys� worked between England and Ireland as working players on possibly basic instruments. The difference between Mahon�s works on this disc and the others is historically significant in several respects. I start with the J.C. Bach Concerted Symphony in E. Dating from J.C.�s final years, it is beautiful, exact and backward-looking; the style is more Rococo than Enlightenment. J.C. had little exposure to the stormy politics brewing up in his lifetime and was genuinely abstract. The, for him, rare inclusion of the modified basset-horn confirms his lifetime exploration of sonority. The Larghetto could stand alone as a languid, expert occlusion of sounds just around the corner of history. He had already used clarinets in a music drama �Orione� and for special effects in his money-spinning work but not in music he considered to be pure. Sadly J.C. died at only 42 but in the final Minuetto (track 8) there are signs of a post-Haydn muscularity, which might have developed from his friendship with Mozart. On the other hand it could have been a separate strand from this youngest son of J.S. Bach who displayed a noted individualism which made him few friends. This might explain why he was buried in a paupers� grave at St Pancras with his name on the mass list being mis-spelled as �Back�. James Hook of Norwich is usually held to be the main exponent of the galant style in England after he moved to London around 1763. He wrote over thirty stage works, odes, cantatas, some two thousand songs as well as instrumental music in what Groves describes as �lighter music�. His unpublished Clarinet Concerto belies that lofty judgement in that the Adagio goes into Beethoven territory without a powdered wig in sight � and it�s very fine. The final Rondo also slips into �controversy� with some harsh tonalities which might have caused the Vauxhall chattering classes to listen for a change. Peter Holman�s insert notes are first rate except in the area of historical research but when a man directs music as well as he does we can�t expect everything. He places instruments superbly and the Hyperion engineers were presumably asked by him to go for the dynamics necessary when bassoons met clarinets back in the late-18th century. This Helios disc is recommended without reservation, not least because it throws up so many questions and answers a few as well.